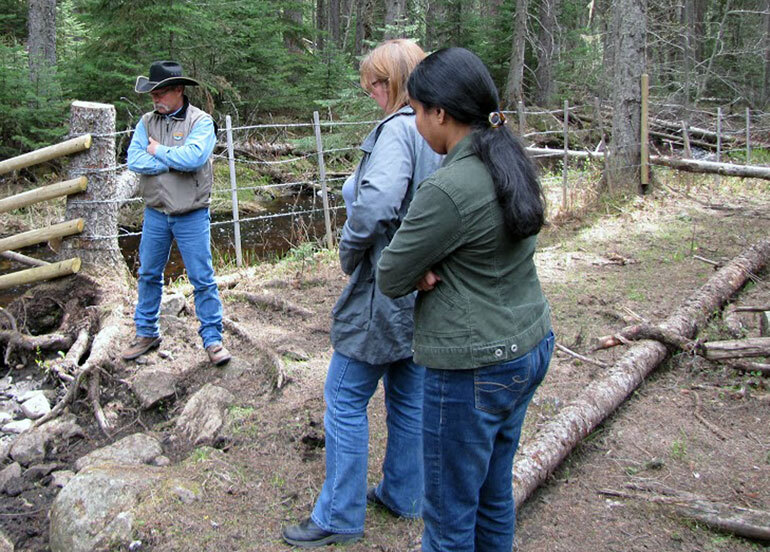 Rob Dinwoodie, with BC Ministry of Forests, Lands and Natural Resource Operations, meets with UBC professor Deborah Roberts and research student Nusrat Urmi at a nose-hole on a creek. The nose-hole is built specifically so cattle can access water without wading into it. Researchers at UBC’s Okanagan campus are working with local ranchers and stakeholders to determine the best way to protect drinking water on cattle grazing lands. Engineering Professor and microbiologist Deborah Roberts is leading student research into drinking water supply intakes and lake outflows. Their study centres on water sources from areas with mixed uses including cattle grazing, camping, hiking, and motorized recreation. 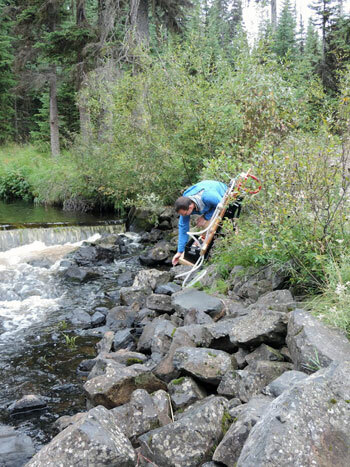 UBC student Keith Story sets up water testing equipment on a creek that is regularly accessed by cattle. Researchers are testing for pathogens such as Cryptosporidium and E. coli. Funding for the $150,000 three-year study has come from the Investment Agriculture Foundation, B.C. Ministry of Forests, Lands and Natural Resource Operations, and the North Okanagan Regional District. Other stakeholders include Interior Health Authority, the BC Cattlemen’s Association, and local municipalities. Ranchers pay fees to the provincial government to allow the cattle onto Crown Lands. Samples have been taken from several sources, including lakes, creeks, water intakes, and areas where cattle graze and wade into watercourses. Researchers are checking turbidity and levels of pathogens such as Cryptosporidium and E.coli. How long pathogens survive in manure, whether rain and meltwater wash them into drinking water sources and the effects of natural contaminants such as leaves, pine needles, and bugs are all being investigated. As well as testing for water-borne illnesses, the students are taking DNA samples to determine whether pathogens found in the water are from cattle or wildlife. Roberts suggests that cattle aren’t the only source of contamination. Wildlife that can’t be fenced — bears, beavers, bobcats — and recreational users who leave gates open, add to the problem. Weekly water samples from Oyama Lake watershed, Vernon Creek, the Duteau Creek water system, and King Eddy Lake watershed have been collected over the last two summers by the team of four undergraduate and two graduate students. The current focus is on the Duteau creek watershed. The goal, says Roberts, is to minimize the health risk for people while balancing mixed uses and recreation in the watershed. 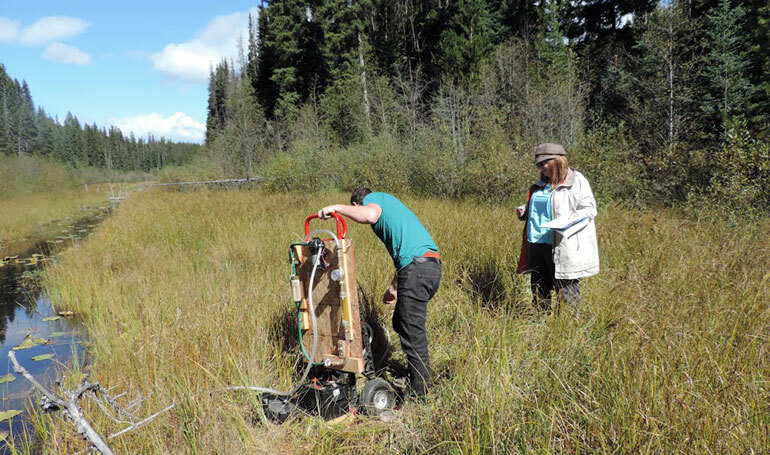 UBC professor Deborah Roberts supervises student Keith Story as he sets up test equipment on a creek in a cattle grazing area.